After a Brexit, Could Poland and Austria Be Next? FILE - People walk past the Polish Mleczko delicatessen and restaurant in London, April 5, 2016. Following right-wing election gains, Eurosceptics in Austria and Poland are keeping a close eye on Britain’s June 23rd referendum to stay or quit the European Union. When Poland’s right-wing Prime Minister Beata Szydlo swept to an election victory late last year, one of the first things her government did was remove the blue European Union flag from the backdrop of her news conferences, and leave only the red and white Polish flag. It was a symbolic, patriotic gesture that signaled a more distant relationship with Brussels. At the same time in Austria, more than 260,000 citizens signed a petition that forced the Austrian parliament to open a discussion on a referendum to leave the European Union. Eurosceptics in both countries are now watching Britain’s march to a June 23 referendum closely. “We need a referendum similar to the referendum in Great Britain, so the people of Austria can decide,” said Robert Marschall, leader of Austria’s EU Exit Party, in a VOA interview. 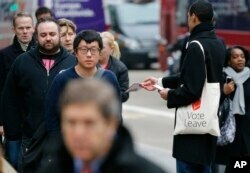 FILE - A Pro-Brexit campaigner hands out leaflets at Liverpool Street station in London, March 23, 2016. Following right-wing election gains, Eurosceptics in Austria and Poland are keeping a close eye on Britain’s June 23rd referendum to stay or quit the European Union. Like in Britain, the migrant crisis that saw more than 1 million mostly Muslim newcomers enter Europe last year is a key driver of the movement to part with the EU. Austria last year took in 90,000 asylum-seekers – an equivalent of 1 percent of its population, at a time when unemployment is more than 8 percent. “Many people do not understand why they want people to come to Austria if there is such a high unemployment rate,” Marschall said. In Poland, where the burning of EU flags has become common at demonstrations, anti-EU sentiments are stoked by memories of historic foreign intervention by Russia, but perhaps more poignantly by Germany. The mandate proposed by German Chancellor Angela Merkel for EU members, including Poland, to accept a share of the migrants has galvanized support for Szydlo’s Law and Justice Party’s pledge to defy the quotas. At the beginning, “there were a lot of voices in Poland in favor of taking refugees from the Middle East,” said George Byczynski, head of the British Poles Initiative, a Polish civic group in London. But the threat of financial penalties for not doing so changed those attitudes. “Suddenly, Poles started feeling this is again an authoritarian approach to helping people,” he said. 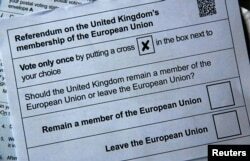 Illustration picture of postal ballot papers in London ahead of the June 23 BREXIT referendum when voters will decide whether Britain will remain in the European Union, June 1, 2016. ​Andriy Korniychuk, an analyst at the Institute of Public Affairs, a research organization in Warsaw, says antimigrant sentiments helped bring Szydlo to power, and he says the anti-EU wave is showing no signs of slowing. “The Eurosceptic movement is growing. If you look just at the general tendencies, recent polls show there are more skeptic movements are growing in Poland,” Korniychuk told VOA. But movements in both countries have failed to gain the same traction that the Brexit campaign has in Britain. In Austria, the petition to launch a campaign to leave the EU led to a discussion on a referendum in parliament on January 27, but it resulted in no action after none of the 183 lawmakers introduced a bill. In Poland, analysts say the country’s status as the largest beneficiary of EU aid is the chief reason the movement has not led to any concrete, significant action for a Polish exit. “Poland is a poster child of European integration. It has a lot of financial support from the cohesion,” Korniychuk said. FILE - Poland's Prime Minister Beata Szydlo, right, and EU Commission Vice President Frans Timmermans before talks on ways of ending Poland's political conflict that has strained ties with Brussels, in Warsaw, Poland, May 24, 2016. Szydlo’s government removed the EU flag from her news conferences but that was, for many, the limit of her willingness to express anti-EU intentions. Since taking office, the Polish leader has never proclaimed quitting the European Union as one of her government’s goals. No one, however, is ready to declare efforts to leave the EU dead in Poland or Austria. Recent gains by right-wing parties in elections in both countries surprised many.